Sometimes it seems like all the attention is focused on fixed wing Special Light-Sport Aircraft. This makes some sense as they represent the majority, about 80% of all types. Still, you can't ignore weight shift trike producers and those working to achieve airworthiness for powered parachutes. After a slow start, we now have 6 trike models approved as SLSA (and I'm waiting for verification on 2 more) plus we have 5 powered parachute models. Sales of non-fixed wing aircraft account for more than 21% of all SLSA registered with FAA with powered parachutes representing a quarter of this one-fifth share. *** Soaring Concepts president Galen Geigley reported his fresh airworthiness certificate was granted October 3rd, becoming model number 59 to earn approval. The company was founded in 2000 and in 2006, their Sky Trek won Reserve Grand Champion from AirVenture judges. Priding themselves on a well equipped aircraft, the 2007 Sky Trek SLSA is available with "leather illusion seats that gives you the premium look of leather with UV protection." 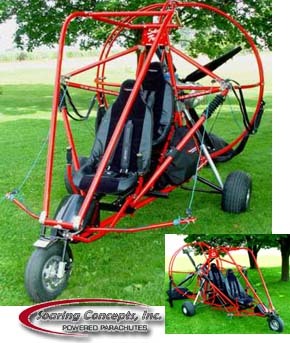 Read More About: Sky Trek Soaring Concepts, Inc.